I rather suspect that if you read this blog regularly, you are also the type to give books as gifts for holidays and birthdays. I have always loved choosing a great book and giving it as a gift. (I also love receiving books as gifts!) We don't deal in books exclusively around here (because there might be a mutiny in that case) but here are a few books we have purchased for ourselves this year and/or ones which might be showing up underneath our Christmas tree. For Bookworm1 (age 8) there is the Guardians of Ga'hoole series . A conservative reading friend of mine from church recommended this series to me in the first place. I read the first book and reviewed it here. I absolutely loved it. I went ahead and handed it over to Bookworm1 who read it and pleaded with me to be allowed to read the rest. I really wanted to read them before he did but as time is limited I decided to trust him on this set. I finally consented to let him read it all on his own and head of me. He read the first 8 books in two seconds flat and is now disgruntled that we don't have the next book in the series. We'll rectify that situation on Christmas morning with a few more titles to keep him going for a bit. Let me just say that I love that I can give him books for Christmas that I know he wants and will enjoy. I know he will enjoy it because he walks around the house with these books and I have to ask him to set them down to do things like....eat. Apparently these are very exciting books for young boys. As he has previously complained that some of the books he has read just "aren't very exciting" it's been thrilling good fun to see him so wrapped up in a book series. Lots of fun! For the young outdoorsman (or woman), there is Camp Out! : The Ultimate Kids' Guide . I purchased this title for Bookworm2 (age 5) this past summer and it is a book he is very proud to own. No, he can't read it by himself but he sits and looks through it and waits for someone to read it to him. This book has all sorts of tips and information for kids who wish to learn more about how to brave the outdoor world. It addresses topics like how to pack for a camping trip, how to watch the weather and keep an eye out for various forms of wildlife, the need for safety and much, much more. There is a "look inside" option available on Amazon to give you a feel for the outline of the book. There are plenty of illustrations and "side bar" comments with additional information. I find it a perfect format for a non-fiction book which is trying to communicate various information to youngsters. Love it and happily recommend it. 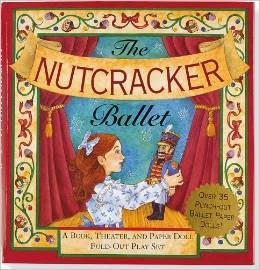 The Nutcracker Ballet : A Book, Theater, and Paper Doll Fold-out Play Set has proved to be one of the highlights of my daughter's Christmas season. She is now old enough (age 3 1/2) to track with the Nutcracker story and has enjoyed hearing/watching it and listening to the music for the past month. She was delighted to be given an early "gift" (to her!) of this paper doll play set. We had a great deal of fun punching out the dolls and talking about the story. She gathered her brothers in on the play. (This is the first year that any of them have really heard the story of The Nutcracker and it is a curious thing to them all!) They divided up the paper dolls and played with them for a couple of hours. The dolls are made out of a nice, thick cardstock and held up well under the play of an 8, 5 and 3 year old! The artwork is beautiful and this playset is a lot of fun. There was a local production of the Nutcracker which we attempted to take all of the kids to. Unfortunately, Booworm3 caught a bad cold and couldn't go! So the boys got to go (and thoroughly enjoyed it) and the girls had to stay at home. Perhaps next year we'll all make it to the show but in the meantime, she's enjoying the music and dancing about like the "coffee princess" in our living area. If you have a little girl who loves to dance, you might wish to consider this gift. Many thanks to Peter Pauper Press for sending a copy of this book in order to facilitate a review. I received no additional compensation and all opinions are 100% my own. It also includes some songs which may be less popular but are nonetheless well known. Songs like: While Shepherds Watched and The Holly and the Ivy. 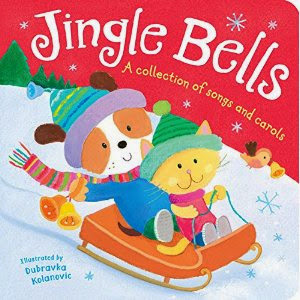 This is a very cute book and a handy one for young budding singers. We highly recommend it. Many thanks to Tiger Tales Books for sending a copy of this title my direction in order to facilitate a review. I received no additional compensation and all opinions are 100% my own. Now I've shared some of the book gifts we have given or plan to give to our kids this year. Do you have that you are planning to gift that you would like to recommend to myself and others? Tell me about it in the comment section below! We have several of the Guardian books but I don't think I realized that there were so many in the series. Wow! I managed to blog what's going under our tree this year (unless I start adding more...) : ) There is always a chance of that!